We all have our little quirks – it’s part of what makes us human. One of my many eccentricities is that, come winter, I tend to hibernate at home in rainforest-like conditions thanks to the combined forces of a humidifier and a heater. Although many a roommate or visitor may find my behavior slightly strange (and think that my delusions of a DIY tropical vacation have gone a little too far) they may not actually realize the Jedi logic behind my humid ways. You see, humidifiers may be well known to relieve colds, sore throats, and general congestion, they also combat many common skin troubles including dehydration, dryness, and even breakouts. Although these concerns are caused by a number of factors, one that stands out, in particular, is the quality of the air in the place we spend most of our time – home! The Venta Airwasher adds the right amount of moisture to your living space while reducing known airborne skin irritants like dust, pollen, mold, and bacteria, making it much more than just your everyday humidifier. 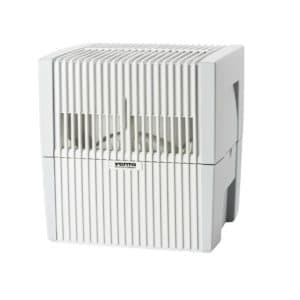 In fact, unlike many of its counterparts that not only are breeding grounds for environmental pollutants but also contribute to unhealthy air (and therefore have a negative impact on skin) the low maintenance Venta Airwasher requires no filters to replace or clean. The humidifier is conveniently available in 3 different sizes to suit a variety of spaces: the LW15 for a small bedroom up to 200 square feet; the LW25 for a master bedroom or living room up to 400 square feet; and the LW45 that helps to keep the air healthy for an entire floor up to 800 square feet, or even a large office space (we’ve snuck one into ours since we spend nearly half our lives there). Best of all, for those of us that hate chores, the Venta Airwasher only need to be deep cleaned twice a year and regularly rinsed out every 10-15 days. Make sure to check out our in-depth guide if you’re interested in learning more about how humidifiers benefit skin inclusive the different types and general best practices.